Learn how to use Drafts 5 to quickly and conveniently capture into OmniFocus on your iPhone and iPad. The first step in David Allen's Getting Things Done (GTD) approach to productivity is capture. This step involves collecting what has your attention into a trusted system for later processing. One key to mastering this step is to make capture as convenient as possible. If capturing into your system is cumbersome, the tendency will be to try to keep track of things in your head, which doesn't tend to work too well. This video features an outstanding app from Agile Tortoise called Drafts. Drafts allows you to quickly and conveniently capture what has your attention into your OmniFocus inbox with minimal friction. Drafts supports the TaskPaper format, allowing you to optionally add additional information to your actions (e.g. tags, a due date, or a flag) as part of the capture process. 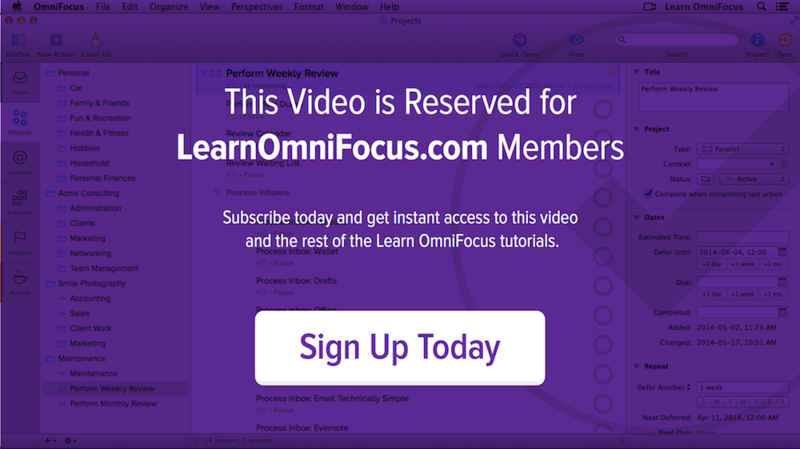 Install the Learn OmniFocus Actions action group. Quickly send single and multiple actions to OmniFocus in the background using Mail Drop. For more information on Mail Drop watch Emailing Into OmniFocus Using Mail Drop to Inbox. Convert an existing draft to TaskPaper format. Efficiently create TaskPaper-based projects and actions the OF Taskpaper action group. Tag OmniFocus-related Drafts for easy access in the future. Configure Drafts for Apple Watch. Use the iOS Share Sheet to formulate actions in Drafts from multiple sources (e.g. webpages) before sending them to OmniFocus. Make use of 3D Touch on an Apple Watch. Everything shown in this video can be accomplished using the free version of Drafts. If you upgrade to Drafts, you'll be able to create and edit actions and access other features, including workspaces, widgets and sharing, and enhanced URL automation. You'll find more information here. Learn OmniFocus Actions — These actions are referenced in the video. You can use them as is. If you're a paid Drafts user, you can customize these actions and use them as the basis for your own Drafts actions. OF Taskpaper — These actions make it quick and convenient to write TaskPaper text that is destined for OmniFocus. Visit this blog post by Rose Orchard to learn more. Visit the Drafts in the OmniFocus App Directory to learn more about Drafts and for links to helpful resources.